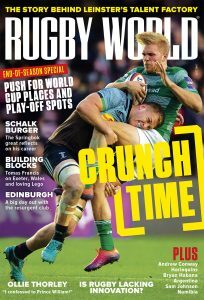 As the end of the season approaches the stakes grow higher for the teams competing in the Aviva Premiership and Guinness Pro12, so the match-winning heroes are all the more celebrated while the villains are for the high-jump. Hats off to two of the Aviva Premiership’s greatest one-club men, Mark Cueto and Ugo Monye, who both played their last home matches for their teams before their impending retirements – and signed off in style. Monye made his Premiership debut for Harlequins in the 2002-03 season and after 12 campaigns in the top flight (and one in the Championship) now has 166 Premiership appearances and 52 tries to his name. He scored two of those tries on Friday night in a Man of the Match performance in defeat against Bath and in so doing, became Quins’ all-time top Premiership try-scorer. Cueto will finish his 14-season career at Sale next week as the entire Premiership’s leading try-scorer after he notched up try number 90 in the 34-28 win over Newcastle. That particular touchdown owed everything to the generosity of Sale’s other wing, Tom Brady, who passed outside to Cueto, when he had a clear run to the line himself. However after 218 Premiership appearances for the club, you have to say Cueto deserves everything he gets. 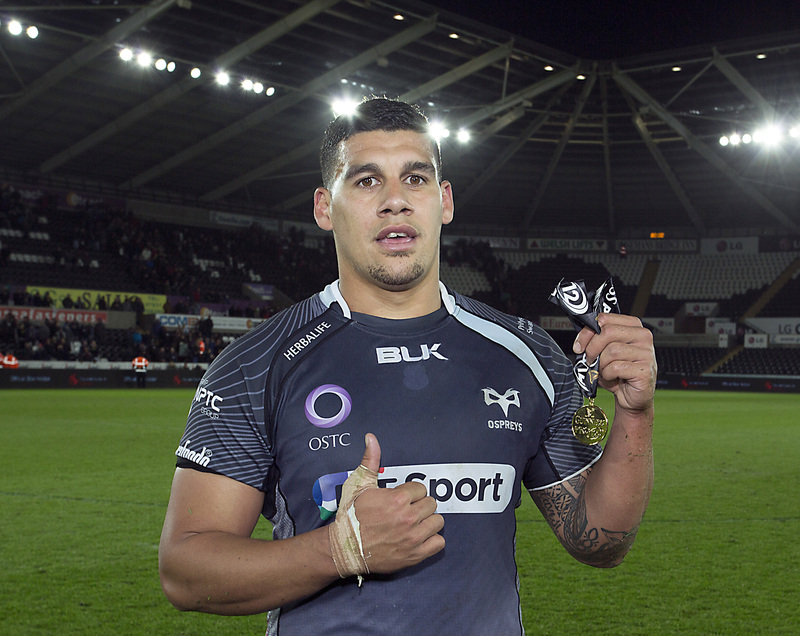 Josh Matavesi was the Man of the Match as the Ospreys beat Glasgow Warriors 21-10 to go into the last week of the regular season in the Guinness Pro12 on top of the table and on a five-game winning streak. The centre had an outstanding game in defence as much as in attack, but some of his limelight was stolen by Ospreys scrum-half Rhys Webb who scored a fine individual try. The Ospreys were 11-3 up after 58 minutes when a lineout move from the training ground sent Webb through a gap and down the right flank, then he chipped deftly over Glasgow wing Niko Matawalu, re-gathered the ball and touched down for his 17th try of the season, which Dan Biggar converted for an 18-3 lead. The Ospreys are still not assured of a home semi-final in the Pro12 as just one point separates the top four clubs but they are in the best position going into the final round next Saturday. George Ford secured a crucial win for Bath at Harlequins with a 75th minute penalty which took the visitors from 26-24 down to 27-26 up and enabled them to make certain of a Premiership semi-final spot – and a home one, at that – for the first time in five years. The lead had already changed hands half a dozen times in a ding-dong battle and the final penalty had to be taken from 15 metres in from the left, not far inside the 10m line, but Ford landed the tricky kick as coolly as you like and sent the travelling fans into raptures. Another kicking hero was being anointed over in Ulster as Paddy Jackson landed a conversion from the touchline with the last kick of the game to give Ulster a 23-23 draw with Munster and enable them to stay in the hunt for a home semi-final in the Guinness Pro12. Jackson’s long pass helped create the decisive try for Paul Marshall, as Ulster trailed 23-16 with the 80 minutes up, and the fly-half then put the conversion on target from wide on the left. 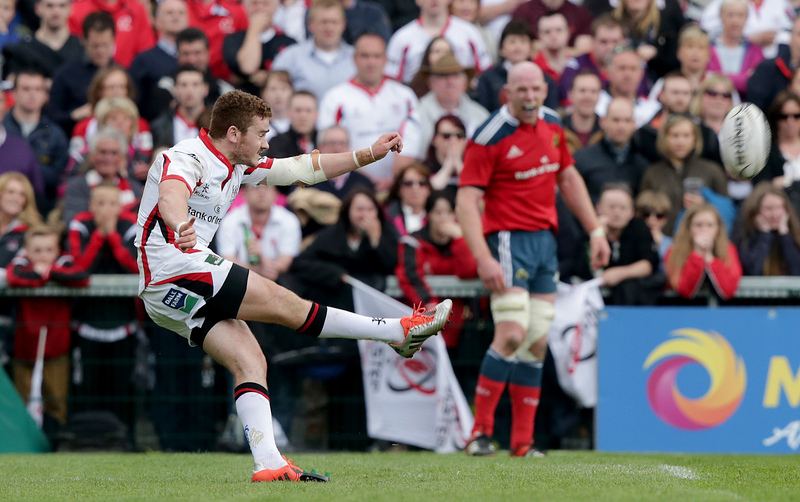 As no away team has ever won a Pro12 semi, it could be a priceless kick from the excellent Ulsterman. Saracens wing Dave Strettle is among the Saints this week for his astonishing, back-handed offload which created a try for Chris Wyles. Saracens were trailing 10-7 to Exeter Chiefs after 20 minutes when a big hit by Maro Itoje forced the ball loose and his second-row partner George Kruis snaffled it. Saracens set off out of their own half with Alex Goode and Wyles making ground then passing to Strettle, who went haring up the left. When Ian Whitten came flying across to make the cover tackle, Strettle off-loaded magnificently out of contact and out of the back of his hand to find Wyles and the centre sprinted in for the try. Leicester’s team deserve a pat on the back for the way they dug in after Seremaia Bai was sent off in the first half, and battled to a 26-21 victory at Wasps – a win which takes them up into third spot and raises their hopes of avoiding becoming the first Tigers side in ten years to fail to reach the Premiership play-offs. Niall Morris, Niki Goneva and Adam Thompstone scored Leicester’s three tries but it was an all-round team effort which earned the precious four points. Thomas Waldrom helped Exeter Chiefs to one of the most crucial wins in their history by scoring two tries against Saracens. Both were from close range after a series of drives by the pack but the second one was particularly clever as Waldrom touched down at the base of the post – the one place it was totally impossible to defend with the mass of bodies on the line. Exeter’s 24-20 win put them in the top four and keeps alive the Chiefs’ hopes of reaching the Premiership play-offs for the first time. For Waldrom, the tries were his 15th and 16th touchdowns of the season, putting him four ahead of the next most prolific players from this Premiership campaign, Tom Arscott and Christian Wade, and just one behind the all-time record for a forward in a Premiership season, which was set many moons ago by Dominic Chapman of Richmond. 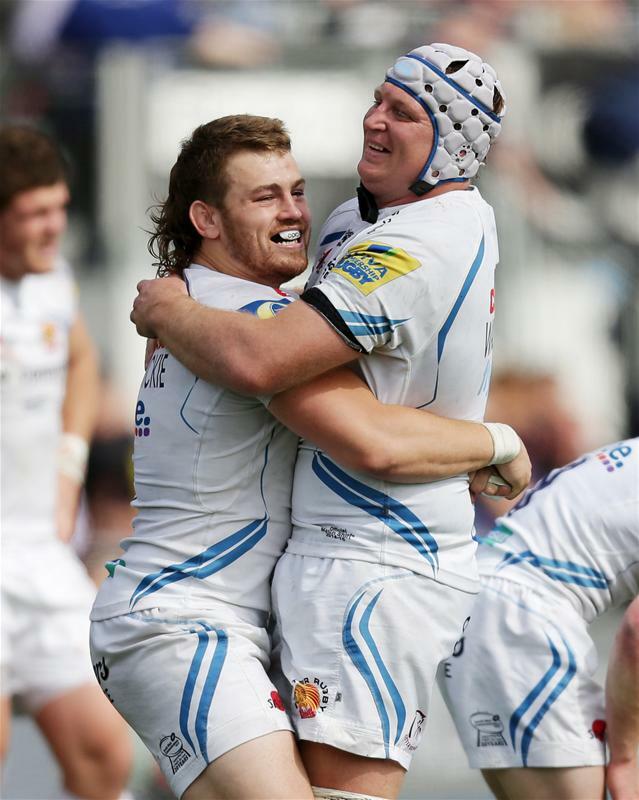 Exeter wing Matt Jess also played a key role in their win, but in defence rather than attack. 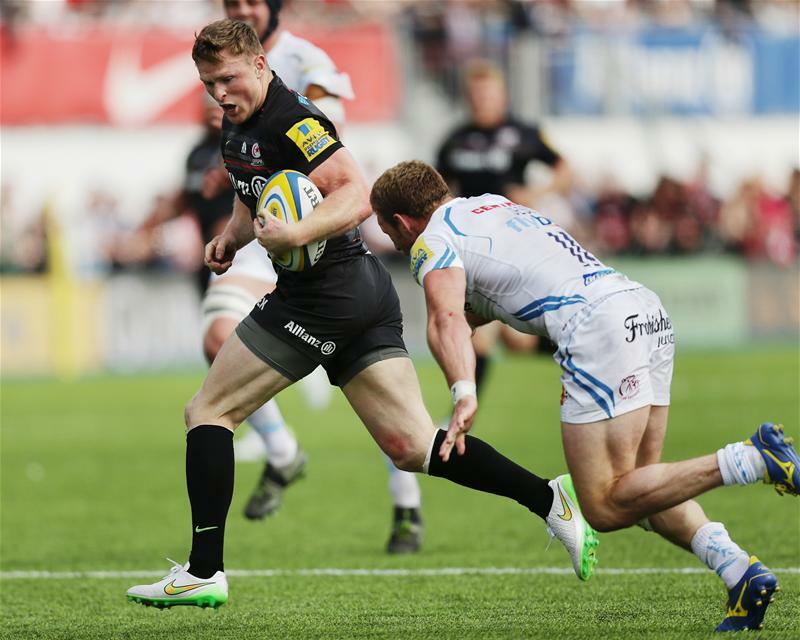 In the dying seconds of the match, Saracens attacked from their own half, seeking a winning try. Dave Strettle was brought down by Henry Slade but Neil de Kock still got the ball to Chris Ashton, who was steaming into the 22 on a diagonal run. The former England wing looked set to score, but Jess chased back and just grabbed his left ankle, bringing him down and saving the day for Exeter. 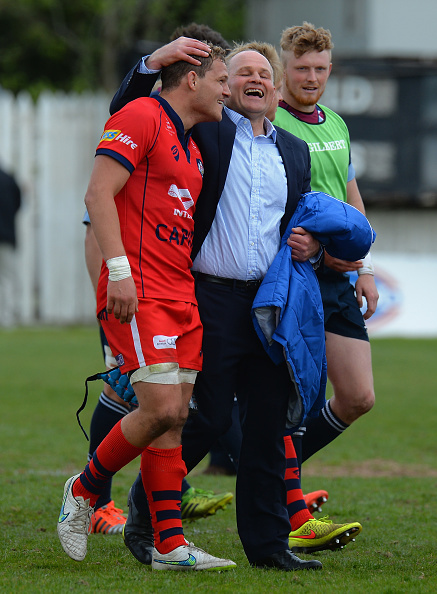 Well done to Bristol and Worcester Warriors, who both negotiated somewhat nervy Greene King IPA Championship play-off semi-finals and will play one another in the two-legged final on 20 and 27 May. Whichever of the two wins the single promotion spot to the Aviva Premiership, they will certainly be better prepared than poor London Welsh were after their surprise play-off victory last year. Bristol and Worcester both have players of international quality in their squads and should cope much better with the step up. Congratulations to the RAF rugby team who became the Inter-Services Champions for the first time since 1994, thanks to the Army’s 36-18 win over the Navy in the Babcock Trophy match at Twickenham on Saturday. The RAF had already beaten the Army 33-29 at Aldershot last month and drawn 32-32 with the Navy, so their squad were on hand to watch the last of the matches at Twickenham and collected the coveted Inter-Services Cup at the end. Two Aviva Premiership forwards received their marching orders in this weekend’s matches, plus one from the Guinness Pro12, as Leicester’s Seremaia Bai, Gloucester’s Matt Kvesic and Ulster’s Iain Henderson were all shown red cards for illegal and potentially dangerous play. Bai flew into a ruck off his feet late in the first half and clattered head first into the exposed head of Wasps’ No 8 Nathan Hughes. At first referee Wayne Barnes showed Bai a yellow card but upgraded it to red after looking at the replays. Henderson’s offence was similar, although his forearm seemed to make contact with Ronan O’Mahony’s head just before his own head followed in, but referee Nigel Owens sent him for an early bath. Kvesic was sent off for a tip tackle on Tomas O’Leary in the 23rd minute of Gloucester’s clash with London Irish. The openside picked up the scrum-half – who didn’t even have the ball – and dumped him on the back of his neck, causing an injury which ended O’Leary’s participation in the game. Kvesic will be the third Gloucester player to be up before the beak in two weeks, after Bill Meakes and Ross Moriarty both got two-week bans last week. One Harlequins staff member should be thanking their lucky stars Marland Yarde came out of Saturday’s match in one piece as their concern for their own safety meant they failed to stop the wing taking a major tumble. The man was sitting on an ice box close to the tunnel – presumably ready to take drinks on – and, when he saw Yarde back-pedalling towards him trying to catch a high ball, he decided to remove himself from the danger zone, but didn’t attempt to take the ice-box with him. Poor Yarde clattered into it and fell over backwards. 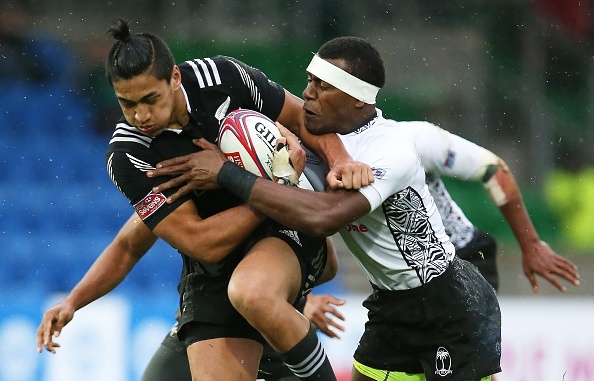 He may be a ridiculously talented, superbly athletic 18-year-old, who has scored 18 tries for the New Zealand Sevens team in this season’s HSBC Sevens World Series, but even Rieko Ioane can’t get away with this top-knot. Make an appointment at the Salon of Shame, Rieko.